The "Mars" Air Jordan Retro 4 will make an unexpected return at one retailer this weekend. Making an unexpected return this weekend is 2006's "Mars" Air Jordan Retro 4. This isn't an official drop, but retailer PickYourShoes has stumbled across a stash of 100 pairs that they'll be dropping tomorrow. For those who need a reminder, the "Mars" Retro 4 features a white leather upper, red and black detailing and a Mars Blackmon graphic on the lateral heel of the shoe. 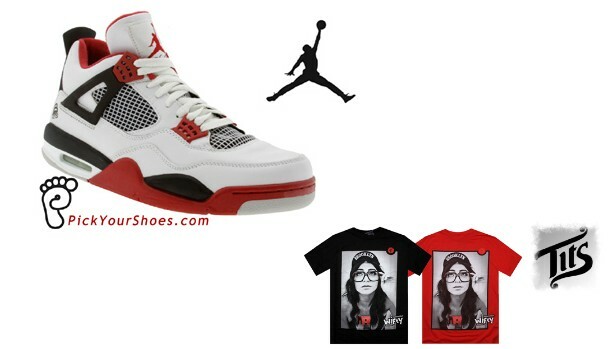 In addition to the sneakers, PYS will release a limited "Mars Wifey" t-shirt by Two in the Shirt in black and red colors. Sizes and price are unknown at the moment, but we'll find out in a matter of hours. If you missed out the first time around, drop by PYS tomorrow and grab a pair.